20 2 blocks to S train which is a 10 min. ride to Brooklyn Botanical gardens, Brooklyn museum and Prospect park/Park Slope. Jazz clubs, Restaurants, boutiques, and antique shops. Convenient location for groceries. Awesome gourmet kitchen, back yard with grill, fireplace, parquet floors , washer/dryer,cable t.v., Internet access, and car service available upon request. Very busy neighborhood,very safe neighborhood. Great Brooklyn Spirit! : Brooklyn is a place that anybody from anywhere can have a great time.
. The Spirit of Brooklyn is a positive vibe. BK's realistic approach to life is what makes Brooklyn what it is. Brooklyn is still shedding it's negative skin from it's past history. But believe, this Brooklyn is back! Come experience what most tourists miss. You'll have a great time! Welcome to the World. : We've got everybody in Brooklyn! Traditionally Brooklyn is and will always be the true crossroads of America. It is from this Borough that so many Americans got their start. Brooklyn represents the world, we have every person from every part of this globe chilli'n and maken a livi'n. Brooklyn will awaken your senses, and give you stories to talk about for a life time. Yes, Brooklyn is the heart of New York City! We have the most people 2.3 million! all united to live as one in harmony. within the past 6 years Williamsburg has become a literal extension of the lower east-side village. There are a reported 35,000 artists working and living within the williamsburg section of Brooklyn. The largest artists population in the world. Great restuarants,clubs,bars, galleries,studios, a real fun place to go out at night. And extremely easy to get back to property location. Just as pictured and more ! The apartment is adorable and clean. David allowed us to drop off our luggage earlier in the day , was so accommodating and told us about local sights and food. The apartment has a full kitchen, and we were all in love with the kitchen table. The neighborhood is relaxed and a short walk to the C and A lines to the city. We loved it here and would love to come back. We very much enjoyed our stay here! We never met David in person but he communicated quickly, with clear instructions, and was available for any questions we had. We ran into Jacqui a few times-- she's a warm, friendly person who obviously has a strong connection with the neighborhood. The apartment was clean and quiet, even during afternoon nap times (we traveled with our toddler and also traveled with our white noise machine, which might not have been necessary.) We appreciated that the center room had blackout shades and that they had a pack and play, high chair, and toys available for us on site. We also appreciated the well-appointed kitchen since we do casual breakfasts at home when traveling. It is also essential to have a proper tub for our baby's bath time and washer/dryer-- this place is equipped! There was a huge arm chair with ottoman that was perfect for cuddling little ones. Parking in the area was also a breeze! Our only con was the heavy scents- there was an oil diffuser and potpourri that we had to move from the main bedroom because it was overpowering for us. Navigating a stroller from the garden/ground level was simple and the subway was just a few blocks away. My husband worked during parts of out visit and I was blown away by how friendly people were with assisting me with my baby. [Tips: I had a small sling and folding stroller for subways without elevators but when he fell asleep, there was always someone offering to help carry the stroller up with me. The men in the Bed-Stay neighborhood were particularly friendly/gracious about this!] I also have to say we felt safe here. I had an old friend who lives in the area and felt totally comfortable walking around in the evenings; it's NY so there are always people out and about. Thank you! This garden apartment is very convenient to the A-train subway (5 mins away) and a restful place to retreat to after a day's busy exploring in Manhattan. The owner David is a lovely chap and kindly loaned us his MoMA membership which was very generous. The kitchen is a nice gathering place to unwind. The two bedroom spaces are interconnected, so for that reason, would work very well for a family, rather than two couples. I would think the outside rear patio would be a great asset in the warmer months. The only drawback, and it is our personal taste, is that the area is not great for quality places to eat, other than some good pastry/coffee shops. We found we had to go further afield for the sort of lighter-style food that we preferred for dinner. Wonderful place to stay with a great location to visit NYC and Brooklyn. Both of our sons live in NYC so for the holiday it was a wonderful place to stay so we could visit with them. Love Brooklyn and the extras of the place made it a nice stay. We will be back. The kitchen was a nice place to make a holiday meal. We were very happy with our hosts and our stay. We spent most of our trip in Manhattan, so the convenience of the metro stop being 3 blocks away was great! Great apartment, great value. Clean, charming, and absolutely no complaints! We have a lovely stay in Brooklyn for our week long NYC vacation. It was great to have a full apartment to return to after spending the day sightseeing in Manhattan. 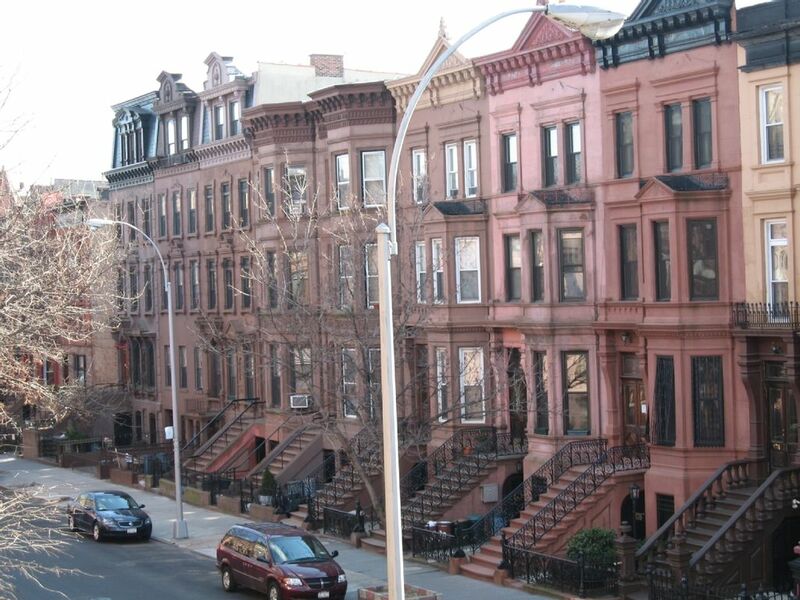 Quiet neighborhood, short walk to the subway, great local resturants and several grocery stores near by. We felt very comfortable staying here, and there is even a bonus back yard for relaxing and grilling. We are a family of 4, and there was plenty of space for all of us. this is New York City we have anything and everything you desire. 24 hours 7 days a week 365 days of the year. $75.00 cleaning fee. Guests over two are an additional $25.00 per night per person .